New article in the Daily News from the 5th of December. New article in the SGS Newsletter. The “highest UN climate protector”, Christiana Figueres, Executive Secretary of the UN Framework Convention on Climate Change (UNFCCC) and her husband joined the breakfast today on Pachamama. 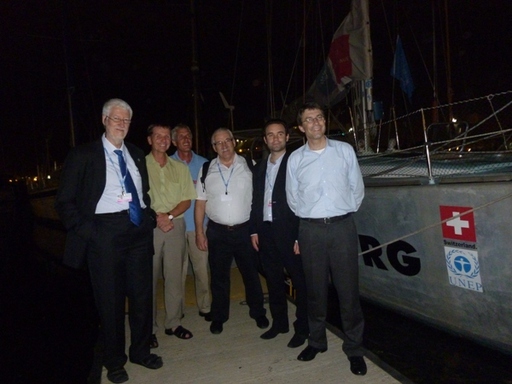 They came cycling from the conference and spent 2 hours on the boat. Christiana and her husband Konrad von Ritter were very interested in the work of the “TOPtoTOP Global Climate Expedition” and put their credits in the “Golden Book” of the expedition. They invited Sabine and Dario to take part in the “Momentum” event at the conference on Tuesday the 6th of December 2011. – Just great that TOPtoTOP has now 2 fans more! 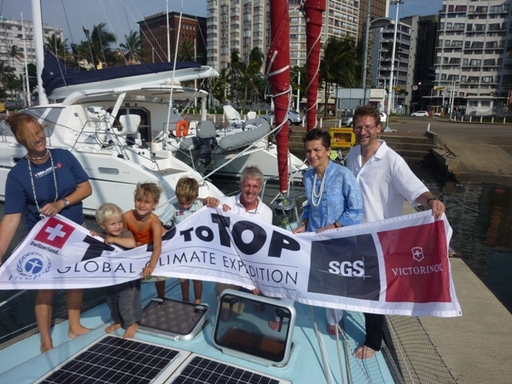 Climate Alliance a partner of TOPtoTOP on Pachamama. Together we motivated 201’146 kids to collect 2’710’340 green footprints to save the world’s climate in 2011. The hand over to the UNCCC Exec. Secretary was yesterday at the conference. 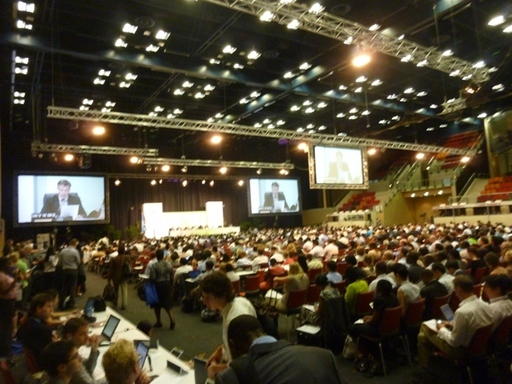 Since Monday 28th November the annually climate conference is taking place in Durban. There are delegations from 192 countries hoping to bring the new protocol that will replace Kyoto-Protocol an important step further.Next to the Durban ICC, where the politicians try to find consents in environmental questions there is an expedition side open to the public. All around the side there are lot of nice places to eat to watch African performances or to see innovative solutions for a greener future. TOPtoTOP is part of the official Swiss presentation in the International Exhibition tent, where we offer interesting presentations and speeches. Wednesday morning we were very glad to see our perfectly repaired mainsail back rigged up. 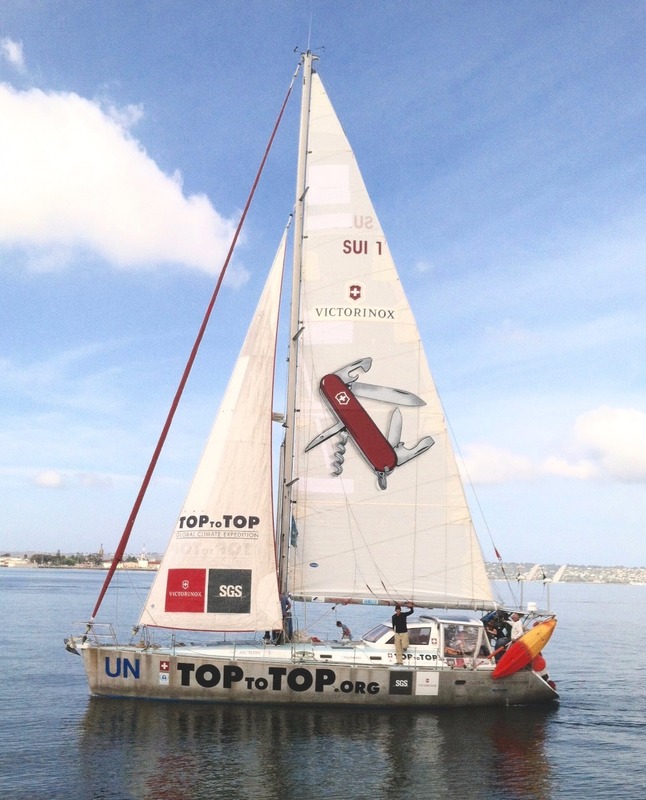 We hope that with the small things we decided to change the sail will be even more durable and secure. 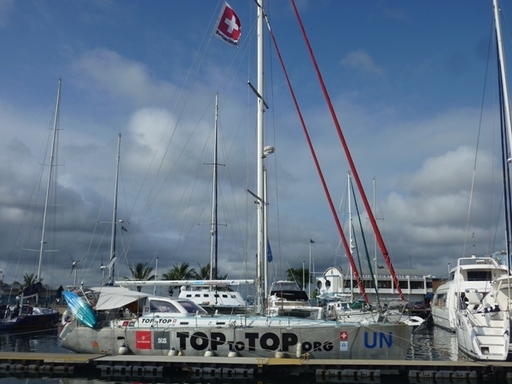 At this place we have to thank to Clyde and North Sails Switzerland. 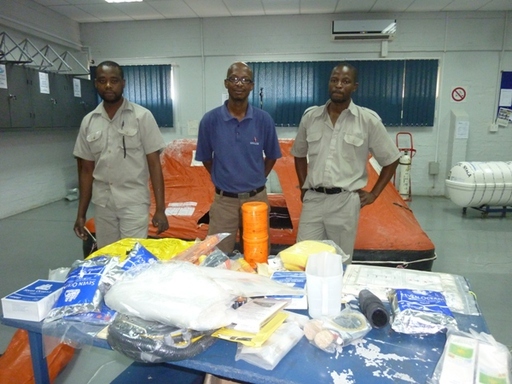 Further we managed to service the life raft. Grindrod, thanks for your support. Many thanks also to our friend and neighbour Erich Ruegsegger for the beautiful Kajak. He was the former chef of the Cadlimo Mountain Hut (Swiss Alps), where we came trough at the start of the expedition in the winter 2002/03! Read the report from 23.03.2003, day 111: Cadlimo Hütte – Andermatt UR (688/165); 17 km, 1968 km Total; 322 Höhenmeter, 55’370 Höhenmeter Total. 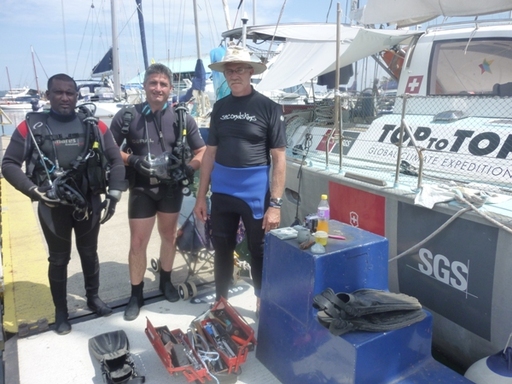 Police divers do a great job: Andre and his team control the underwater in Durban harbor for bombs (COP17) and helped us changing the anodes on Pachamama. They had to dive in a sewage tunnel under the ICC (conference) the day before and some got sick. Nurse Sabine cured them with some tea. On Tuesday honorary consul Hanspeter Graber organized a dinner for the discussion group of countries where Switzerland is part of it. Members from the delegation of Lichtenstein, South Korea, Monaco and Mexico and Switzerland visited Pachamama. 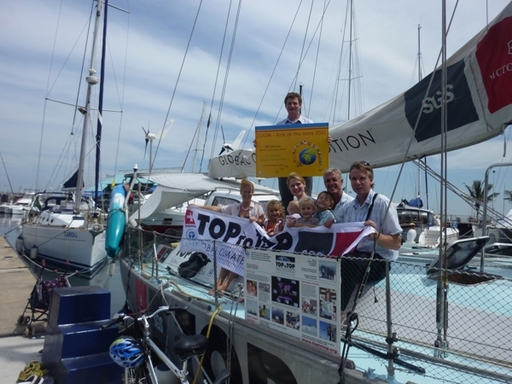 Before dinner TOPtoTOP held a presentation before at the Royal Natal Yacht Club. 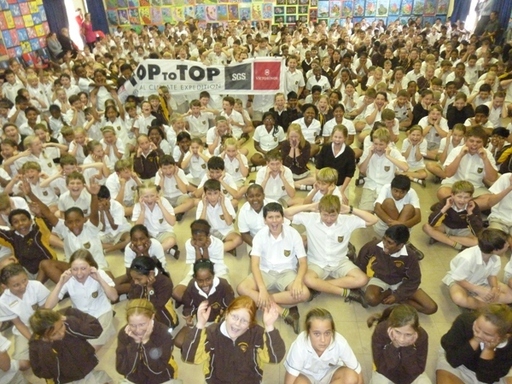 Already 800 students visited in Durban! 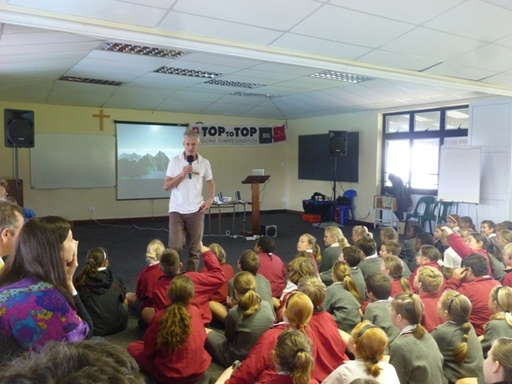 Many thanks to Alison and Quentin Hurt from SGS in Durban for organizing the school visits.